One of my VERY favorite desserts in the world is cheesecake. It’s just so creamy and tangy and silky and cheesy and DELICIOUS, you know? Pair it with a delightfully crumbly crust (with a slight hint of spice – which is why I prefer a ginger snap crust to a graham cracker crust), and it truly can’t be beat. There are many ways cheesecake can go wrong (too dry, too eggy, too sweet), but fortunately, this cheesecake suffers none of these shortfalls. In general, I prefer not to muss up my cheesecake with all kinds of toppings – but if you’re into that sort of thing, I did make a blueberry compote to go along with this cheesecake, and it was very well received! (I did not partake. I am serious when I say I don’t want anything messing with my cheesecake.) I’ll post that recipe first thing next week. A quick note before you start: this cheesecake NEEDS to be refrigerated overnight for optimal texture and taste. It’s actually even better if you refrigerate it for two days before eating – but overnight is just fine! 1.) Preheat your oven to 350°. Finely crush your ginger cookies into uniform crumbs (easiest with a food processor, but you can also use the “ziploc bag, rolling pin, and a lot of pent-up aggression” method). Use a fork to combine the ginger cookie crumbs, melted butter, and sugar, until everything is evenly moistened. 2.) Pour the crust mixture into a 9″ springform pan. Use your hands to press the crumbs into the bottom of the pan, and about an inch or so up the sides of the pan. Bake for about 8 minutes, until set. 3.) While the crust cools, raise your oven temp to 450°, and make your filling. Add the cream cheese and sugar to the bowl of a stand mixer, and beat with the paddle attachment (on medium-low speed) until well-combined and fluffy, 2-3 minutes. 4.) Add the eggs two at a time, mixing until fully combined after each addition. The final addition will be one egg and one egg yolk. Add the greek yogurt, vanilla, and lemon zest, and mix until smooth. 5.) Pour the filling into the (completely cooled) crust, leaving a little more than 1/2″ of space at the top of the pan (you may not use all of the filling). You will completely cover the crust, including the sides. 6.) Place the springform pan onto a rimmed baking sheet to catch any overflow, and place into the oven. Bake for 15 minutes, and then lower the oven temperature to 225°. Bake for another hour and fifteen minutes. 7.) Turn the oven off, and open the door. 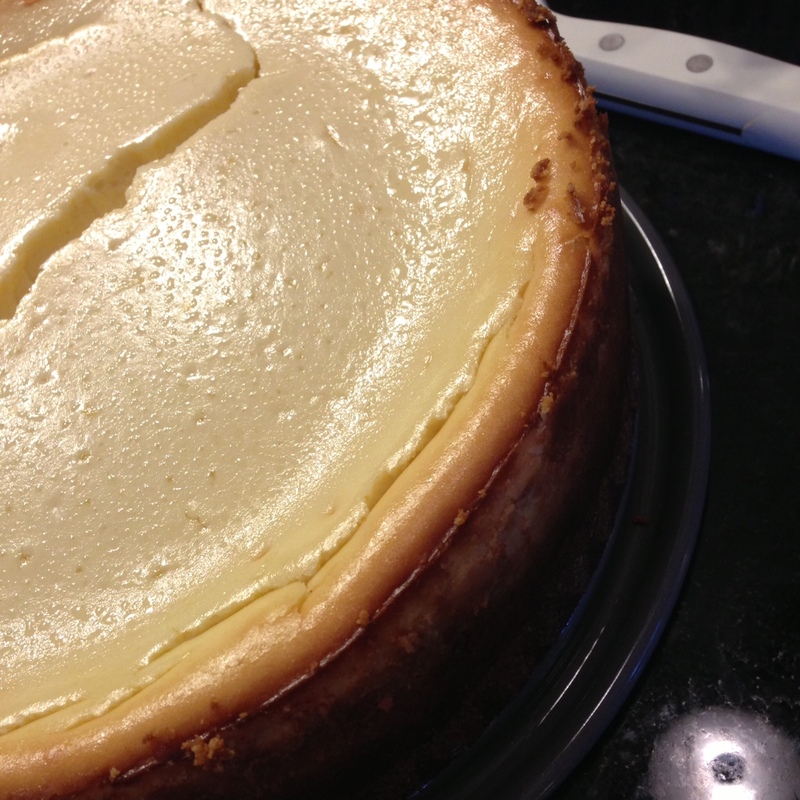 At this point, the edges of the cheesecake should be golden brown, and the center of the cheesecake will still jiggle a bit when you gently shake the pan. Allow the cheesecake to cool in the opened oven for about 30 minutes. After 30 minutes, remove the cheesecake from the oven, and allow to cool completely, another 2 to 3 hours. 8.) Wrap tightly, and refrigerate overnight. Serve cold. This cheesecake is perfection. Perfectly smooth in texture, unbelievably creamy and moist, with a touch of brightness from the lemon zest, and a hint of spice from the crust. PERFECT. I could eat a piece of this cheesecake every day for the rest of my life. 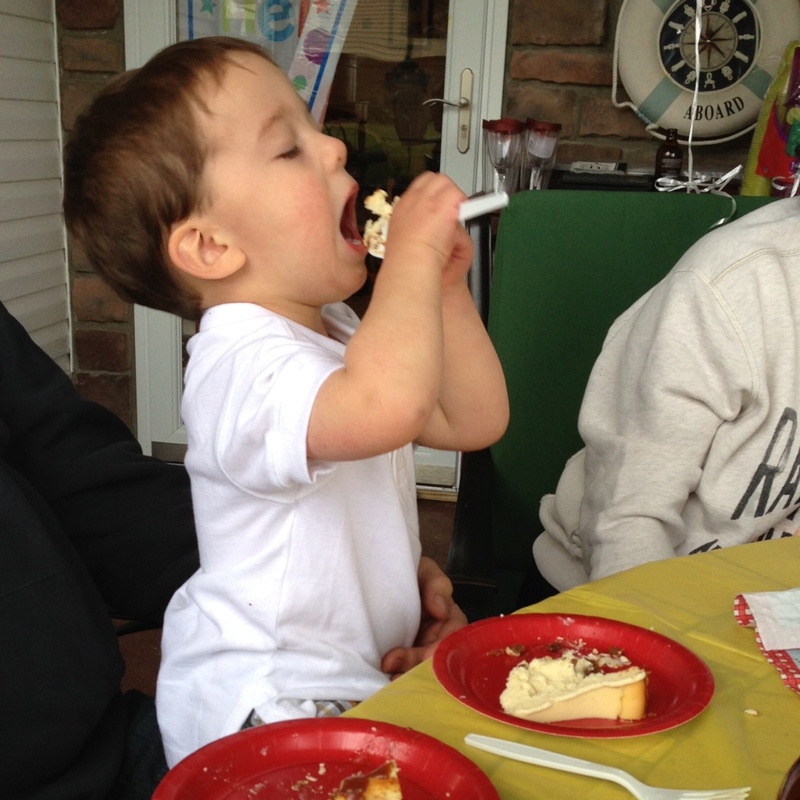 A daily dose of cheesecake: essential for maintaining those adorable elbow dimples and rubber band wrists! 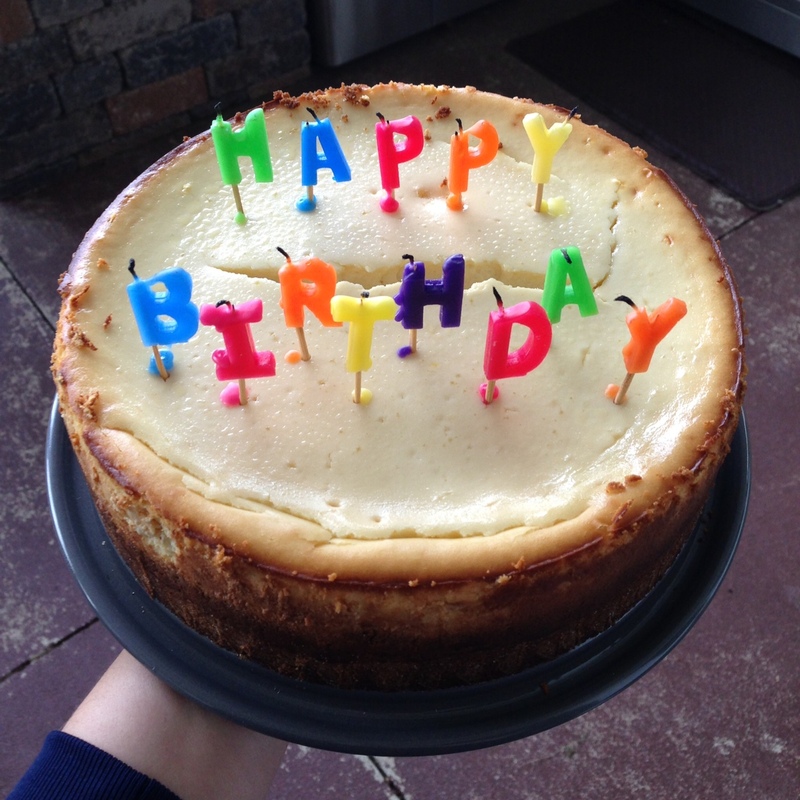 matthew is also a cheesecake purist, and so he will love this. can’t wait to try it!